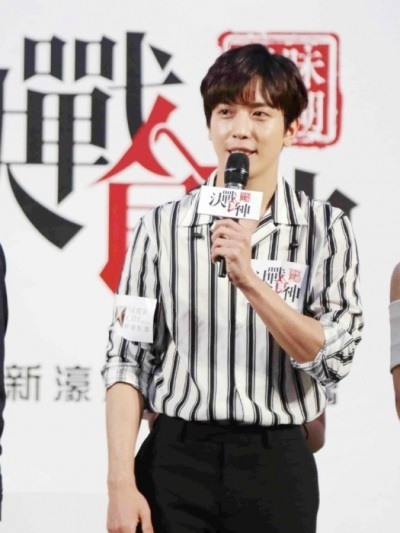 Singer-actor Jung Yong-hwa attended a press conference for the new Chinese film “Emperors Cook Up a Storm” in Macau last weekend. Pictures of Jung at the event, which he attended along with fellow cast members Nicholas Tse, Tiffany Tang, Ge You and Bai Bing, were unveiled on Tuesday. Jung also complimented Tse by saying that the Hong Kong singer-actor has attractive eyes. The gastronomy-themed film centers on the competition between a chef from Guangzhou, played by Tse, and the top chef of a restaurant with three Michelin stars, played by Jung. The film, which has a budget of 46 billion won ($38.5 million), is produced by Hong-Kong based Emperor Motion Pictures.